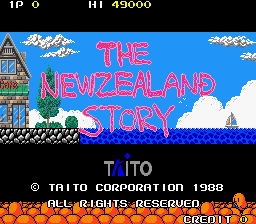 Released at a time when Taito was pumping out cracking arcade titles one after the other like Rastan, Darius and Operation Wolf, The NewZealand Story is, by a country mile, my favourite of them, and probably my favourite Taito game of all, serving as a living summary of what they did best at the height of their power. Tiki the Kiwi's friends at the zoo, including his girlfriend Phee-Phee, have been kidnapped by Azarashi the Leopard Seal, and so he has to rescue them all by himself, traversing the North and South Islands of New Zealand with just a bow and arrow and any vehicles and power-ups he can get his hands on. 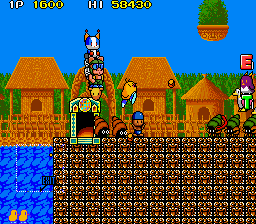 All sorts of weird animals and hazards stand in his way, as do the maze-like rounds themselves, but Tiki can do it! While he starts every round with just a bow and arrow, Tiki is a pretty versatile and mobile character. He doesn't have the ability to run- this does mean the game's speed is perhaps a little sedate for some, but as we'll see that's not true for everything in this game- and so on the ground at least, there's no momentum to worry about like in Super Mario Bros. 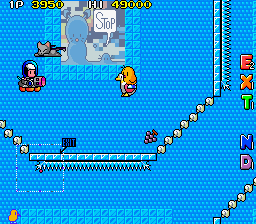 This is much closer to Bubble Bobble with slightly more control over your jump, but for the challenges presented by the game- notably precision platforming- it does the job very well. 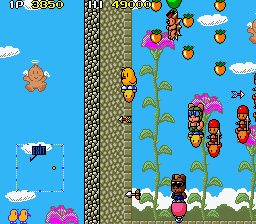 In particular, being able to 'queue up' Tiki's next jump is a very useful skill that's invaluable in higher-level play. What makes the game special in terms of movement are those vehicles you can steal- with different speeds and stats, you have a lot of variety in terms of mobility, and coupled with the power-up drop system, can give the game a vague improvisational feel where you have to work with what you have to proceed. It rewards memorisation, there's no doubt, especially in terms of the environmental hazards, but when things go wrong and you lose your preferred vehicle or weapon, you can always recover with what you have. The round designs also take advantage of the fact that Tiki can fly with the help of vehicles- they're rarely a walk from left to right, with Tiki going all over the map to reach the goal, and exploring in the time you have is rewarded with EXTEND letters for extra lives and hidden warps. The vehicles and round designs compliment eachother perfectly. The main thing people tend to think about when it comes to The NewZealand Story is its difficulty- it's known for being a stern challenge. As someone who plays on Hard or higher (one of the few games I can genuinely say I'm not really that bad at), even on the standard difficulty I'd say that's a fair assessment. 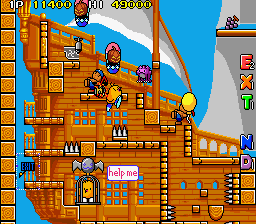 The rounds get increasingly long and complex as the game goes on, and the enemies remain constant and aggressive. However, as this is an arcade game, putting in a little time will let you in on the many tricks and strategies to help you survive. From little things such as 'queueing up#' jumps, to more critical things like how enemies telegraph their attacks and how to effectively use vehicles in different situations. 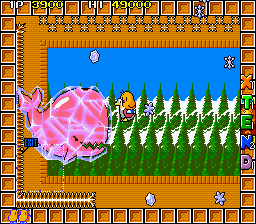 The main bone of contention in terms of difficulty comes in the form of the final two rounds which disable checkpoints without much warning, and although the final boss is the easiest in the game, it still becomes a bit of a sticking point. All you can do is practice. With that said, I think the main thing that keeps me coming back to The NewZealand Story is that, on my preferred difficulty setting or yours, it remains challenging. This is a balancing act that only the best games can claim to have, and I feel this game absolutely has it. I've one-credit cleared the game many times but even now I still have to change strategies when the game's challenge catches up to me. 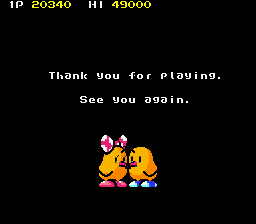 Sure, it's a game I have a lot of personal affection for, but I think it absolutely stands on its own merits, and encapsulates Taito at their best- the cutesy graphics, the infectious music, the many secrets, and the on-point game mechanics and design. A classic. Dedicated to all maze game fans. Back to the Shorts index!